Baby's the size of a cucumber! His skin is getting smoother, but his brain is getting more wrinkly...to make way for all that essential brain tissue. He's now strong enough to grasp a finger! Movement: He is still very active in the morning and at a night, but I'm feeling him a lot throughout the day. His movements are getting bigger and stronger! Cravings: Not too much lately. Symptoms: I have had horrible back pain lately. I know it's normal and it's my body stretching and adjusting, but I don't really remember it hurting this much with Karis. Best Moment This Week: Jack continues to be more active and it is fun to feel him everyday! 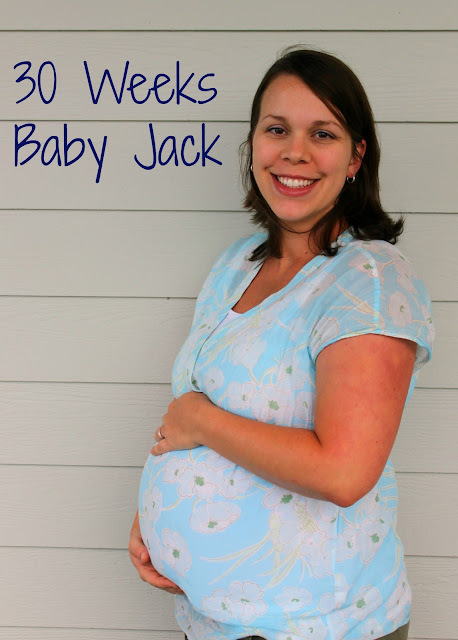 I'm so happy to be at 30 weeks! We are 3/4 of the way there...75% done...woo hoo! It's really starting to set in that he's going to be here soon. Yes, we still have a couple months to go, but I have a pretty strong feeling that these couple of months are going to go pretty quickly. Karis continues to be her same sweet self with her baby dolls. Yesterday we were talking to John on the phone and she was holding the phone up to the baby doll, so she could talk to John too. Too funny! She's a sweet heart and will be such a good big sister. I passed my glucose test a couple weeks ago...woo hoo! (At least I'm assuming so since I didn't get a call and they said they would call if there was a problem.) I'm going to the OB later today, so I will let you know if there are any other updates. I also had my first ever visit to a chiropractor on Monday. I'm going back again today. He said I've got some work to do to get things back in line. Because I'm pregnant and my joints are already loosening to prepare for the baby, they don't like to go too fast with things. I am hopeful that this will help with a VBAC this time around. I will keep you updated as things progress.